Zach: How are you guys looking forward to your headline set at Slam Dunk Festival? Aaron: We can’t wait. We love playing festivals and we love playing in the UK, so we’re pretty sure we’re going to have an amazing time. Zach: Your slot is a rotating headline one with Less Than Jake, how does it feel to be sharing a stage with those guys? Aaron: We are very excited to finally be sharing the stage with our good friends in Less Than Jake again, we did a USA and Canada tour together in ’07 and it was the most fun tour we have ever been on. This will also be our first time playing together in the UK, so I’m pretty sure everyone who attends this event will have their heads explode from the sheer awesomeness. Zach: What can people expect come to expect from your set? Aaron: Pure liquid entertainment, mind blowing eargasms and fun beyond their wildest imaginings! Zach: You released your greatest hits compilation ‘The Best Of Us For The Rest Of Us’ last year, what made you feel it was that time in your career to bring out a best of? Aaron: We just have written a lot of great songs over the years and we don’t own the old studio recordings, those all belong to Jive Records, so it was our way of taking our music back. Zach: Are there any other bands that you’re hoping to catch whilst you’re at the festival? Aaron: We’re excited to see our old friends in The Starting Line. We did a USA and Europe tour together back in 2002 and haven’t seen those guys play in forever! Zach: Do you guys plan on sticking around for the aftershow party once all the performances are over? Aaron: Oh, hell yes! The afterparty is the best part! 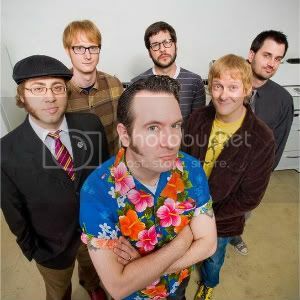 Zach: What’s planned for Reel Big Fish once Slam Dunk is over? Aaron: We’re going to be doing a USA tour this Summer with Streetlight Manifesto and our friends in New Riot. Zach: Is there anything else that you’d like to add or share with our readers? Aaron: We just want to thank all of our loyal RBF enthusiasts out there for their support. We couldn’t do what we do without the fans! LEEDS SET TIME: 21:30 – 22:30 (9:30pm – 10:30pm) on the Jägermeister stage. HATFIELD SET TIME: 20:15 – 21:15 (8:15 – 9:15pm) on the Jägermeister stage. NEWS: Don Broco single ‘Beautiful Morning’ to be re-released and played on BBC Radio 1! NEWS: Slam Dunk Festival launch local unsigned bands contest for 2013! NEWS: Twin Atlantic and more named for Slam Dunk Festival 2018! NEWS: Slam Dunk Festival move North site; drop Midlands date for 2019!